Many of you know our loving mother Lois Solomon. In addition to being the most devoted mother to us, at the very young age of sixty three she has twelve grandchildren and seven great-grandchildren. Like many other young women she started a family very young. While raising us as a single mother, Lois worked as a waitress at various restaurants. Her last employment was at a senior center where she managed the dining services and cleaning crews. Seven years ago Lois was diagnosed with C.O.P.D. (chronic obstructive pulmonary disease). She has emphysema. This is a horrible disease. With emphysema, you gradually lose the ability to push air out of your lungs; your legs ache and feel like they weigh hundreds of pounds as you try to lift them to walk. Lois’ health has deteriorated to the point that she is no longer able to work and do many of the things she used to be able to do. Her doctors at Tampa General Hospital have told us that her only option now is a life-saving lung transplant. Not only is a lung transplant major surgery but it is also very expensive. Even with insurance there are many expenses that are not covered and must be paid for out of pocket. Some of these are co-pays, deductibles, and Lois will be on a lifetime of anti-rejection medications. This is a challenge we can not meet alone and your help is desperately needed. To help with some of these out of pocket expenses a fundraising campaign has been established with HelpHOPELive (HelpHOPELive) in honor of Lois. HelpHOPELive is a nonprofit organization that has been helping the transplant community for more than 28 years. All contributions are administered by HelpHOPELive exclusively for uninsured transplant related expenses. Donations are tax-deductible to the full extent of the law. 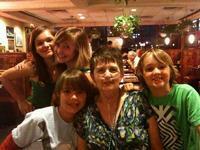 Please consider making a donation to help Lois get one step closer to lung transplant surgery. To make a secure credit card contribution, call 1-800-642-8399 or select the DONATE NOW button. It is never easy to ask for help and now is certainly no exception. Lois has touched the lives of many and we deeply appreciate the support she has received. At times like this, the assistance of family, friends, and the community is crucial to help ensure a positive outcome. There are not enough words that can express our family’s gratitude. We thank you in advance for your thoughtfulness and prayers. A COPY OF THE OFFICIAL REGISTRATION AND FINANCIAL INFORMATION MAY BE OBTAINED FROM THE DIVISION OF CONSUMER SERVICES BY CALLING TOLL-FREE, WITHIN THE STATE, 1-800-HELP-FLA. REGISTRATION DOES NOT IMPLY ENDORSEMENT, APPROVAL, OR RECOMMENDATION BY THE STATE. FLORIDA’S REGISTRATION NUMBER CH296. Lois received a lung transplant and is doing very well! !